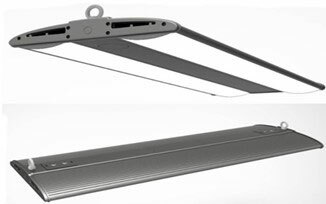 Linear highbay fixtures are known to have an industrial look. Well, that was true until yesterday. Today Aleddra, the technology leader in dual-mode T8, PL, and HID replacement LED lamps, announces its new stylish Linear Highbay LED fixture. It comes with a slim body, a sleek black finish, and two parallel light engines. One distributor commented that it is too pretty to put in the warehouse. We would have to agree. Mounting accessories are included, saving the installer both time and money on getting the mounting parts. The default color temperature is 5000K. Other colors are made to order.